I have made a family connection that came as a surprise. Some of you know that DearMYRTLE and I are cousins. That came about by some computer screen sharing during a couple of presentations. The new cousin, Crista Cowan, The Barefoot Genealogist was giving a presentation on livestream/ancestry, and like Myrt saw a name, location, and timeframe that I knew. Now, this IS a challenge. Related to someone at Ancestry? What a golden opportunity to try to demonstrate how I use a connection, through an Ancestry Member Tree (AMT), to collaborate. I live within 2 hours of the “common place”. It was a Quaker Meeting, had hoped with an attached Burial Ground, so I started to see if we had a connection. I certainly knew the Surname that got my attention, found it very quickly in my genealogy database. We shared our links to our AMTs, sure enough, not just one surname but several. But, I haven’t looked at that branch for a very long time. I better get to work and clean it up, as I have been doing. So, I thought I would share a lesson, already learned in the past, GO BACK AND LOOK AT WHAT YOU HAVE, and I have. I started with about 300 Family Group Sheets from my Dad’s first cousins. I worked with them over 10 years ago. So, I had all of those Family Group Sheets entered into my database. 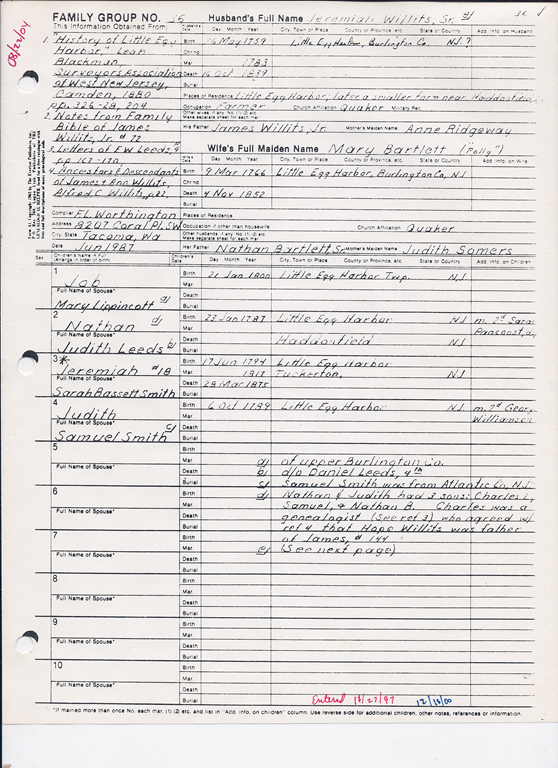 So, I am taking this time to Scan these Family Group Sheets, putting the Citations into the correct Source Template for this type of document. Then I go back and check that all of the facts / events on these sheets are properly cited. Although done 10 – 12 years go, I hadn’t done too bad of a job. So, why blog about that ? Because I also read the notes that I already had in my database. It came from this page of that Family Group Sheet. I am sure you can’t read that, but this is what it said, that got my attention and the reason for this blog post. 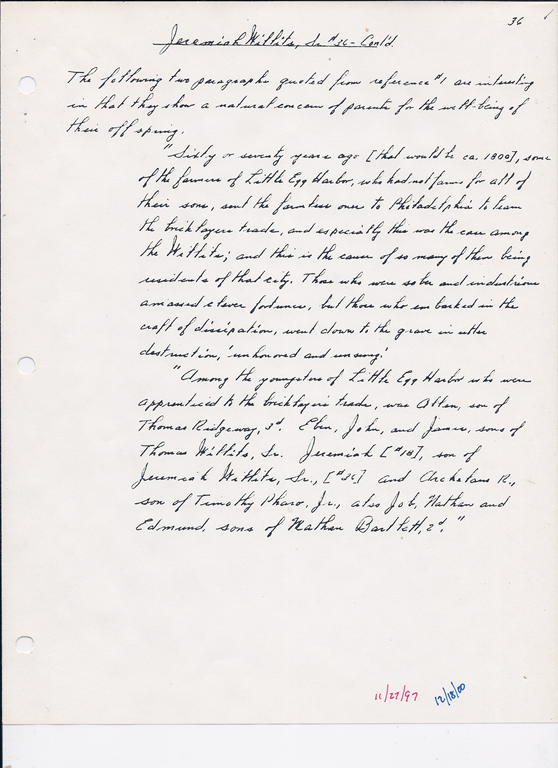 “Sixty or seventy years ago [that would be ca 1800], some of the farmers of Little Egg Harbor, who had not farms for all of their sons, sent the farmless over to Philadelphia to lean the brick layers trade, and especially this was the case among the Willits; and this is the cause of so many of them being residents of that city. Those who were sober and industrious amassed clever fortunes, but those who embarked in the craft of dissipation, went down to the grave in utter destruction, “unhonored and un____”! That little, re-read note, with 10 years of learning under the belt, NOW I have a Hint about why this family left Little Egg Harbor and moved closer to Philadelphia. The family did have a large farm, and I need to go back to Little Egg Harbor to find the farm, but the mentioned children headed to Philadelphia to learn a trade. Sounds like a reasonable reason to relocate. That last name, Nathan Bartlett, may be connected to The Barefoot Genealogist family. Lesson Learned: Re-Read what you already have. You may have learned something between the time you entered it, or last looked at it. May have given you new eyes to see what you want to find. As you might know, I just returned from Salt Lake City, UT and Roots Tech 2012. Lots of topics, talks, chatting, looking a techie stuff and lots of other things, including talking to other Genea-Bloggers. We heard a lot about Social Networking in many formats. About an hour ago, My friend Midge Frazel, of Granite In My Blood, simply posted, on FaceBook “Quaker Family: Small Breakthrough”. Since I read and follow her blogs, I had to look, especially with my Quaker Roots. Her “small breakthrough” had a link to the Quaker “Monthly Meeting” in Adrian, Michigan. I know that place. I opened my family file, went to Adrain in my file to verify who had an event there. Elizabeth Willits married Samuel Leeds in Adrain. 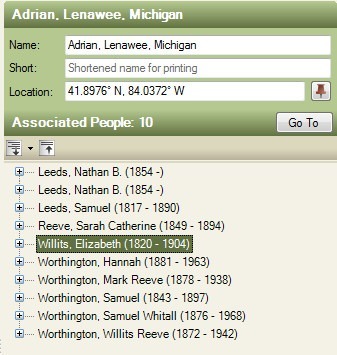 Elizabeth is my 2nd Great Grandmother. Friends’ review: a religious, literary and miscellaneous journal, Volume 31 and on page 825 was this article. Samuel Leeds was her second marriage. She had previously married Henry Wilson Worthington. Lesson Learned: The value of Social Media.